As an exercise in futility, few chores can rival deleting photographs to gain a bit of space on your hard drive. With memory so cheap these days it is a pursuit that will never repay you the time that might otherwise have been spent outdoors. However, the nights are closing in. My family have already grown bored of my presence this week and are asking when I will be going back to work. I have had my dinner and the TV is rubbish. So let’s call it reviewing some old trips, shall we? And we’ll delete the bad shots as we go. Here’s a trip I had forgotten about; Toronto during June. 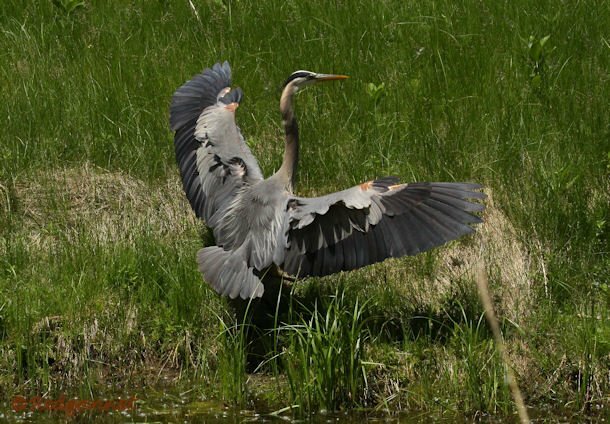 A Great Blue Heron flushed from the near bank as I approached the lake in Angrignon Park. It crossed to a small island with some rough grass and bushes on it. A few reeds skirted the edge. 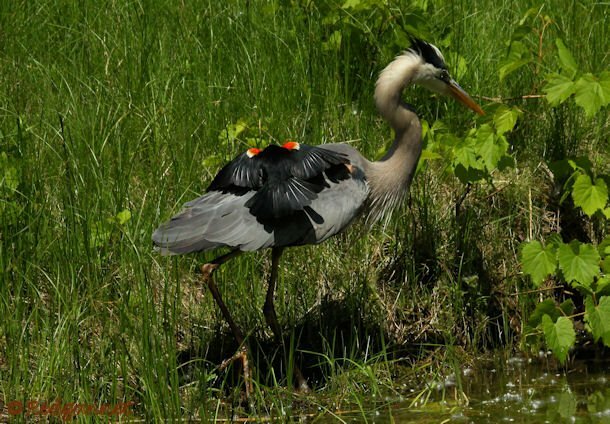 The heron had barely folded in its wings when a black fury fell upon it. 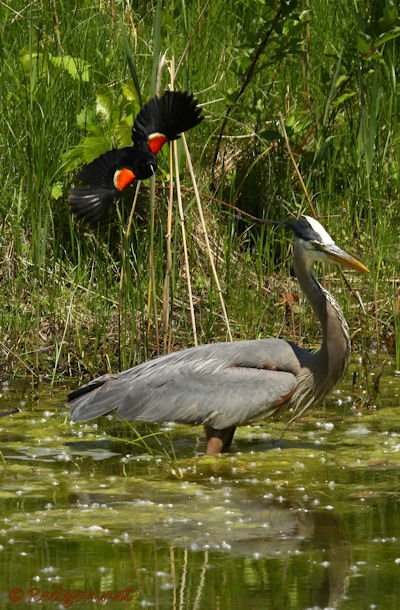 An angry Red-winged Blackbird attacked again and again, flashing its bright epaulettes and hitting the heron hard in the middle of its back. The blackbird appeared to be purposefully targeting the heron’s back. It did not try to strike the head or neck. Possibly it preferred to stay well clear of that tremendous beak. Despite taking thumps that could be heard across the water, the heron seemed almost oblivious to its attacker. It continued to fish, working its way slowly along the bank while the blackbird continued its assault. 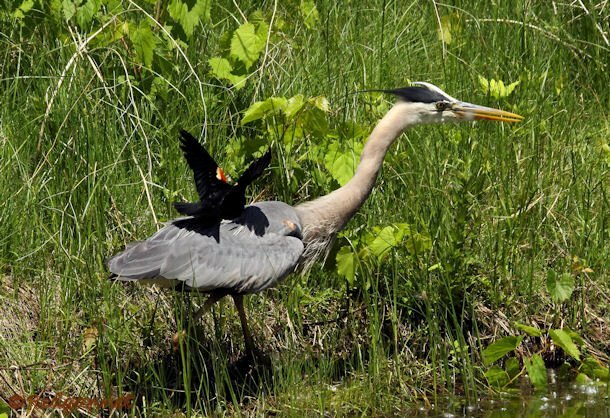 The only acknowledgement that the heron even noticed its attacker was a slightly raise crest. I imagine that if you hunt close to nesting birds and you have a reputation for snaffling a few chicks if parents are not vigilant, you have to expect this sort of reaction. What fabulous photos! Do not delete them! Great pictorial story, Redgannet. 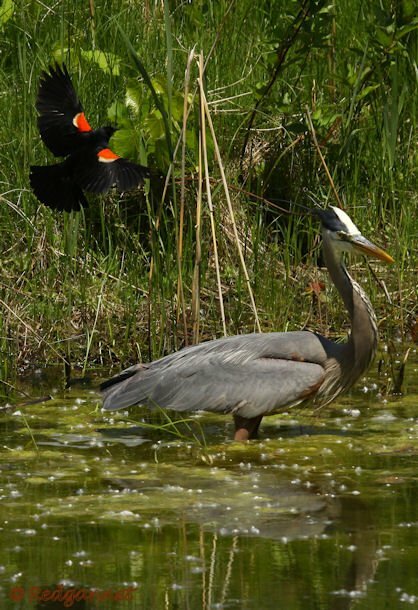 Question: Is “Great Gray Heron” an alternative name for Great Blue Heron? Well spotted Donna. I even pandered to the American spelling of this mythical bird. Tell me. What are we paying Corey for if he is not picking up on these mistakes? Also, amazing sequence of shots! Also, what else do you have hiding on your hard drive? I want to see!